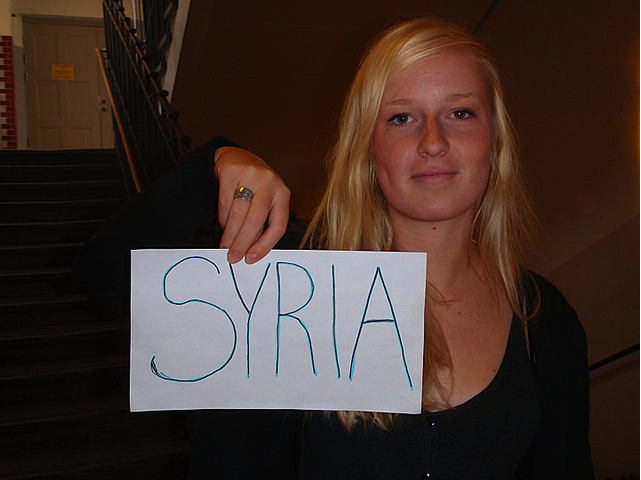 There is a series of photographs on AmnestySE Flickr page showing smiling middle class, pretty people holding a sign that simply reads Syria. These pictures are taken in various locations, from streets to offices to bedrooms, some digitally modified, a few show couples, some are more artistic than others, but all share the simple sign-plus-portrait setting. One assumes that what these photographs mean is that these people unite over the Syrian cause (whatever that is), they know that something is happening there which is not “right,” they are conscious about it. The pictures could also imply that the person in the picture is a supporter of Syria. These pictures are also quite similar to mug shots, so they could also imply that the person in the picture is Syria. The pictures could also imply that “we,” people holding the sign that reads Syria, are complicit and acknowledge that we are responsible for what is happening in Syria, it is our lifestyle or our elected government, or the politics that we benefit from, etc, is somehow by some degree responsible for the mass murder of civilians in Syria.